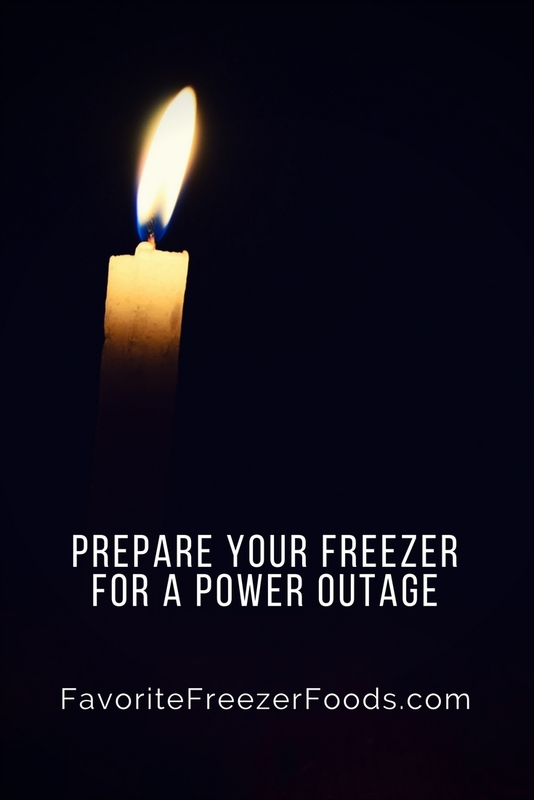 Prepare your freezer for a power outage due to rolling power outs, hurricane, tornado, other natural disaster where power outages are expected and you might not have to throw out all your frozen food. Power outs of some sort are a fact of life for many of us. If it's not due to the weather it might be because someone blew the electrical fuse, or somehow the freezer gets unplugged. It takes a long time and a lot of money to fill your freezer. A few simple steps might help you save your investment. 1) Leave the freezer (and fridge) plugged in and turn the freezer as cold as you can. While you might want to unplug things like your TV and computers in case of power surges you should leave the fridge and freezer plugged in and turned up so they are at their coldest until the very last minute the power goes out. You can keep a thermometer in the freezer (and one in the fridge). While the ideal freezer temperature is 0F turn the temp as low as possible until the power outage risk is over. The fridge should be 35-38F. Group food together - but organize your freezer so foods like baked goods are on top, fruits and veggies below that, then precooked foods and raw meats on the bottom. That way if your freezer does thaw you'll be able to salvage as much as possible and wont have to throw away food due to cross contamination. Fill your freezer from the top down (use baskets in chest freezers) so if there is some flooding as much food as possible will be safe. While you can expect that the temperature in the fridge will start rising in 4 hours, a full large-sized freezer will not start to thaw for about 2 days. However, a half full freezer will start to thaw in 24 hours. Freeze extra food in your fridge like leftovers, raw meats, milk and cheeses that you won't need immediately. If you have more than one freezer, including the little freezer attached to your fridge move as much as possible to your largest freezer. The sheer mass of food will keep everything colder longer. You want to fill as much space as possible in the freezer. But when you're expecting a freezer power out you don't want to go buy more food. Instead fill empty gallon jugs, from milk for example, with water. Or fill coffee cups of fresh drinking water and freeze, leaving room for the water to expand when it freezes. Want to leave them there all season? Place the ice cups in a sealed plastic bag in case of spills when thawed and to prevent the water from absorbing tastes and smells. No time to freeze water? Fill your freezer with dry foods like dry pastas, bags of flour, sugar, coffee etc that you don't want to get wet if your house gets water damage, however, denser foods like meat, or even water, will stay colder longer. Empty your automatic icemaker or ice dispenser and turn off the ice maker so it doesn't melt and spill and ruin your floor while the power is out. A freezer bag full of ice cubes will give you a way to gauge if and how much the food in your freezer might have thawed and refroze. Store it in the door if possible as that area gets warmest. A penny on top of an ice cube also shows if the freezer thawed but doesn't give as much detail as a full bag of ice cubes. Storing food in garbage bags or plastic storage containers means faster clean up if the freezer does thaw and all the food goes bad. At the least consider this for raw meats and anything with dairy. Consider making a freezer inventory so you know exactly what you have without needing to open the door. You've prepared just in case, but now the power is out and you want to safe your food. Here's what to do. Don't open the door unless you have to. Consider taping it shut to remind yourself to only open the freezer if you absolutely need to. If you expect the power out to last awhile you can cover your freezer with blankets or quilts. Leave the ventilation exposed in the back for when the power does come back on. If you have time before taking shelter, crumple up paper to put between the freezer and blankets as yet another layer of insulation. If you can get a hold of enough dry ice it can keep your freezer frozen an extra day or two. Be sure to follow the safety guidelines and never touch it with your bare skin. 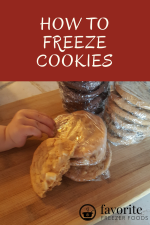 Share with neighbors if you're freezer stash is thawing and there is nothing else you can do about it. At least your food won't be wasted. Know what can refreeze and what to toss. Have a food thermometer (aka meat thermometer) or something similar you can pierce into foods. If they still have ice crystals and the food is below 40 F it can be refrozen. Toss ice cream and fish that has thawed even if it refroze before you got there. Turn the dial to the coldest setting until everything is fully frozen again. Defrost and clean the freezer if it's mostly empty. Got some time to plan ahead? 1) Defrost your freezer before the storm so there is less ice build up to thaw and flood out of the freezer. 2) Keep a freezer inventory so you know what's inside before you open the door. 3) Get a generator to keep your critical appliances, like your fridge and freezer, running. Electric companies warn not to plug generators into household outlets because it can backfeed the electric system and puts electric workers at high risk. 4) Prepare foods to a point that it's easy to eat or reheat without electricity. Make sure you've got plenty of propane or charcoal for the grill. 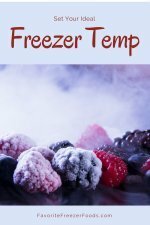 Now that you know how to prepare your freezer for power outages learn more about freezer cooking basics. so you can keep your freezer full of yummy, healthy food when the power is on.